One of the nice vSphere features is the ability to define DRS rules. The feature allows a vSphere administrator to control the placement of virtual machines in a vSphere cluster. There are the VM to VM affinity and anti-affinity rules, and the newer VM to VMHost rules. With the VM to VMHost rules, vSphere introduced the concept of VM and VMHost groups, and the ability to have rules that are a requirement (‘shall’) or a preference (‘should’). In a recent VMTN PowerCLI community thread a PowerCLI user had a query about exporting and importing DRS rules and groups. At that point Matt Boren and myself developed the idea to provide a PowerShell module. The PowerShell module, which we named DRSRule, provides all the functions we deemed useful for working with DRS rules and groups. And yes, the module includes an export and an import cmdlet ! Matt Boren, famous for the high quality posts on his vNugglets blog, and myself, started working on the module, and after some late evenings and long weekends, we now have a first version we want to make public. There are already many blogposts on the subject of DRS rules and groups. 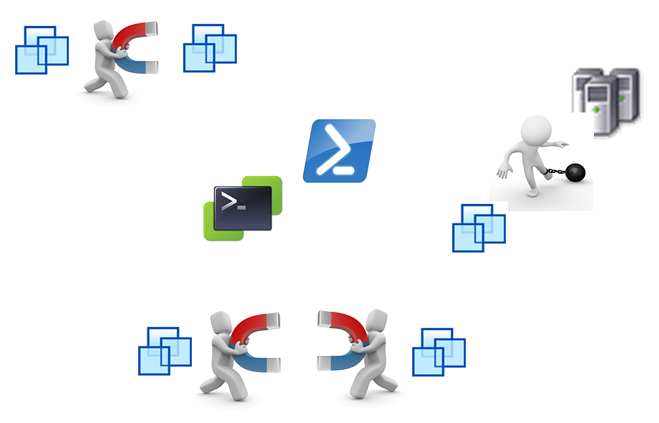 Including some excellent PowerCLI posts. The first one that springs to mind is Arnim‘s excellent Managing VMware DRS rules using PowerCLI. And don’t forget to read Matt’s post on the DRSRule module as well. To get you on your way with the DRSRule module, Matt and myself compiled the following introductory text. The core PowerCLI from VMware allows for many of the DRS rule operations that one might want to perform. There have been questions over the years in the VMware Communities PowerCLI forum about how to export DRS rules and groups, and, on how to then import such items. How to get the DRSRule module ? The repository is managed by the GitHub organization PowerCLIGoodies, and in there is the DRSRule repository itself. Grab the latest version from the GitHub repository. Or you can select any other folder. Then, load the DRSRule module into your session. Please also read the note below about using Unblock-File, since this module is not Authenticode signed. Since there is no Authenticode certificate supplied for this module, and, assuming that one’s PowerShell ExecutionPolicy is at least RemoteSigned, below is a quick/easy way to unblock files. But, this should only be done when you trust the code in the files that you are unblocking — inspecting the files is for your own good. The DRSRule module was set up as community resource, so we are hoping to see your comments, suggestions and code. Does anyone was able to make this work on powershell 6 on linux appliance ? I’m using the module on windows server so far against a VC 6.0. Since I’m migrating to 6.7, I’d like to make it work on Linux appliance. I’m running powershell v6.0.2 on CentOS Linux release 7.2.1511 (Core). Unable to find type [DRSRule.VMGroup]. Any idea to make this work on my linux powershell appliance 🙂 ? I found that the latest version extracted to a directory named DRSRule_Latest. If the directory name isn’t changed to DRSRule, Powershell refuses to recognize it as a module at all due to the directory name not matching the base name of at least one of its files contained within it. awesome script which helped me a few times already. Now I have an environment where there are many virtual datacenters and a certain vSphere cluster name shows up in each of those DCs separately. When I export the rules now, I get the rules from ALL clusters with the specified name. Any idea how to easily adjust the module to narrow down the scope to a cluster within in a SPECIFIC datacenter? That´d be great. Most of the DrsRule functions accept a Cluster parameter. Or do I miss the question? Great module, thanks alot ! I am not the greatest scripter but i can manipulate existing scripts. Does anyone happen to have a working script that I could use as a template for exporting and importing these rules? Would it be possible to specify a vCenter using the import command? I’d like the ability to specify which vCenter to run the import against while connected to multiple vCenters. When I run the import it errors. It looks like it’s trying to create every group\rule twice. I can use a -ErrorAction SilentlyContinue for the groups. It won’t let the script create multiple copies. But, it does create multiple copies of each of the rules. The .json file only has one entry for each of the groups\rules. I’m attempting to use the DRSRule without much success. I’m receiving the same error as Gram in his post further above. I have confirmed that the DRSRule module is in the $PSModulePath. I have also successfully run the Import-Module DRSRule command. Can you make any suggestions on where I might be going wrong? Just a quick question. Is it possible to use the export-drsrule cmdlet and then import these rules into a seperate cluster using import-drsrule. The new cluster has different named ESXi hosts and also the VM’s have not yet been migrated over. If the new environment doesn’t have the same ESXi hosts nor VMs, you would have to edit the export file to adapt the names. Once done, you should be able to import in the new environment. I asked this yesterday – but my question diappeared…? What, if I export some rules und groups from a cluster and migrate this cluster later to another vCenter? Can I import this rules und groups from this previously made export? Due to a Migration from a cluster to another vCenter, I assume all objects (cluster, Hosts, VMs) get a new ID and therefore the import will fail? Sorry about that, don’t know what went wrong. On your question, the Import-DrsRule function will create the Groups and the Rules. The creation will be based on the Name, not the ID. So if the ESXi nodes, the cluster and the VMs are present, the importing of the rules should work. I wonder if this could be usefule as I want to export from my current Windows VCenter 5.5 and import the rules to my new vCSA 6.0 VCenter. What about the VMId? Will it be the same when I disconnect my ESXi’s from old VC an connect them to my new VC? I’m afraid not, the VM-ID will be different in another vCenter. But the export does also contain the VM’s name, you can use that to import the rules into the new vCenter. I don’t understand. How can I import if the VM’s names are correct, but the VM’s IDs wrong? Does a wrong ID have no Impact? If you use the Import-DrsRule function, the IDs have no impact. The function uses the Name field to recreate Groups and Rules. Note that the cluster, the ESXi nodes and the VMs need to be there. a path was included, verify that the path is correct and try again. Which PowerShell version are you running ? Sorry for the late answer, but the reason was an old Powershell Version. Many thanks for that great work! I can export to the json file fine. When i try to import it finishes almost immediately with no output and nothing is imported. Have you seen this before? No, can’t say I did. Could you eventually email (link on my blog page) me the json file ? Make sure to replace sensitive information before you do. Add-Type : Cannot add type. Compilation errors occurred. It looks as if PowerCLI is not installed. Can you use any of the PowerCLI cmdlets ? The reason is that the default path that includes this dll is changed. this is a timer saver. thanks for the work on this module. the assembly that contains this type is loaded. Is the folder where you stored the DRSRule files present in the $PSModulePath variable ? You guys are life savers, busy migrating hosts from one VC to another. You saved me a night of manually re-creating hundreds of rules! Thanks Tom, glad it helped you. Hi Luc. Is there any chance you could add the vsphere hostname as a property of get-DrsVMGroup? This is cool – Great job!